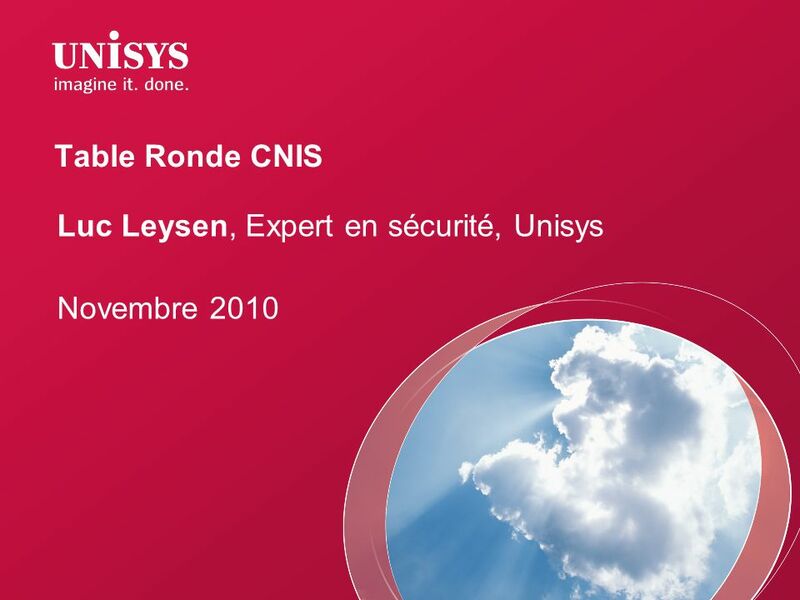 Table Ronde CNIS Luc Leysen, Expert en sécurité, Unisys Novembre 2010 Key message: This presentation discusses Unisys cloud computing strategy announcements on 30 June 2009 and 2 November 2009 and what it means to clients. Today I’d like to share with you an exciting new strategy from Unisys that combines innovative security with a suite of solutions to expand your options for delivery of IT services in the cloud. We announced this new strategy and related offerings on 30 June 2009 with announcement of our cloud-in-a-box solution – Unisys Secure Private Cloud Solution – on 2 November 2009. This strategy is intended to overcome CIOs’ concerns about security of data in the cloud, cited by organizations and industry analysts as the top impediment to adopting cloud computing for business needs. It will enable organizations to move enterprise application workloads securely to tailored cloud environments with greater confidence in maintaining the integrity of critical information. In fact, we like to say that we’re smashing the barriers to adoption of cloud computing with our innovative cloud computing strategy and solutions portfolio. La Sécurisation des données en dehors de son environnement sécurisé La visibilité non-autorisée de ses données dans un environnement partagé Les erreurs involontaires d’administration cloud Résultant en accés non-autorisé Provoquant la fuite de ses données vers d’autres organisations, clients ou concurrents Protection des données et de la vie privée Les procédures d’audit du fournisseur cloud La capacité du fournisseur cloud à l’aider à répondre aux exigences de conformité et de règlementation Conformité Key message: Questions such as those shown here concerning data protection/privacy and compliance are why clients worry about security with cloud computing. 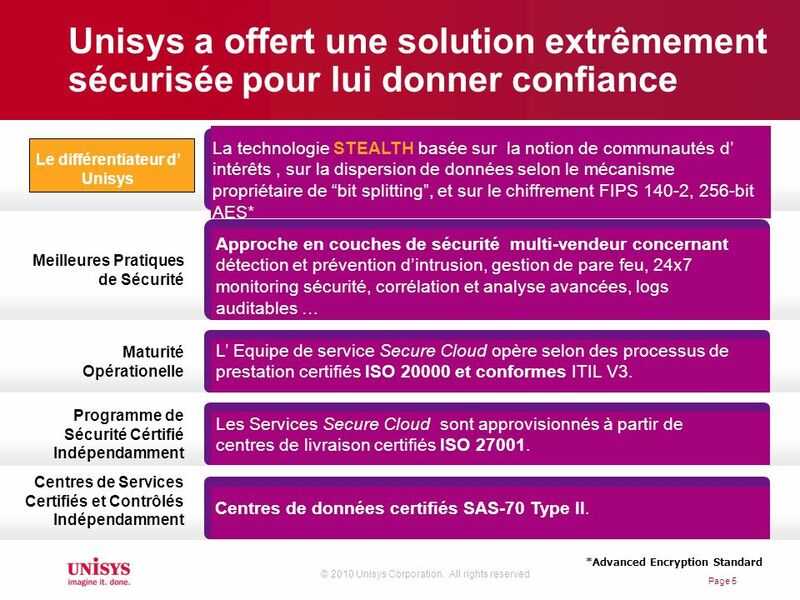 What if Unisys could allay their security concerns? Why should you worry? Let’s first remember that cloud computing, by definition, means that you are sharing a computing resource with other users. We should also remember that most conventional business applications contain sensitive data, such as: customer, patient, employee, financial, or other proprietary information that must be guarded and protected. Unlike conventional computing, where we can control all the infrastructure within our own firewalls, and where we can lock down data in controlled means, a shared cloud resource must also be secured to be able to meet most security compliance requirements. Here are a list of questions you should ask any cloud provider to answer to assess their ability to meet your security needs: Data Protection and Privacy How will you secure my data outside my firewall? Unisys Stealth for Network protects your data across any network topology to our Secure Cloud. How will you ensure there isn’t unauthorized visibility to my data when in a shared computing environment? 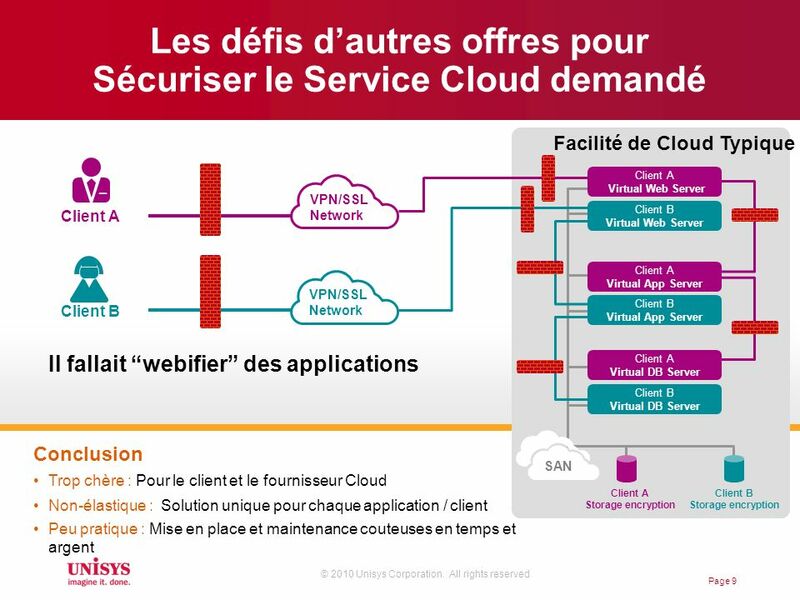 Unisys Secure Cloud Solution only allows authorized users to access or assemble data. Even Unisys operators cannot see the data, unless given explicit permission by you. What about unintentional cloud administration errors? Providing unauthorized access/rights to others – Only you can grant access rights. Causing your data to go to other organizations, customers, or competitors - Even if Unisys did make such a mistake, with the Unisys Secure Cloud, the data is protected and cannot be made visible or whole, unless permission is granted, so no one without permission could use the data if it got out of our control. What if there is a potential breech of the virtualization hypervisor (i.e. virus)? So far, no one has created a virus that attacks a Virtual Hypervisor. But, what if this did happen? 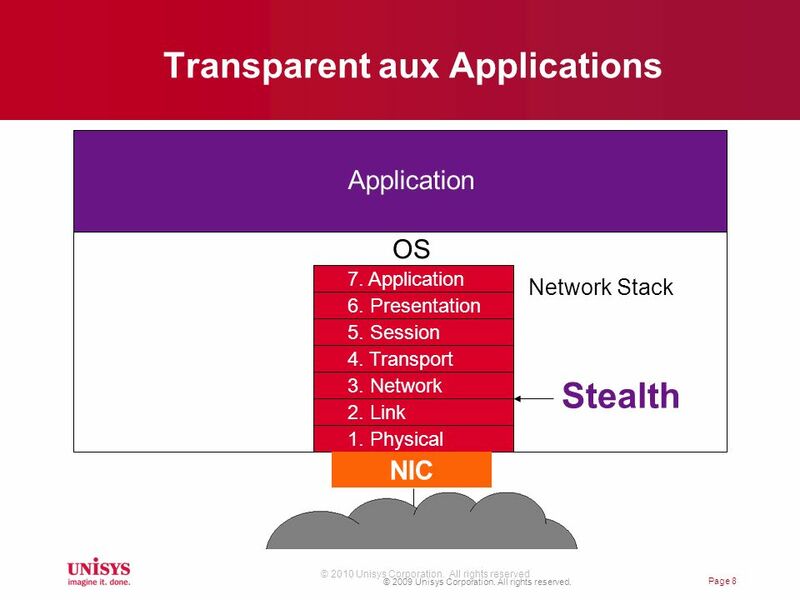 Unisys Stealth still is protecting data, and no unauthorized users can gain access to the data, even if the Hypervisor loses control. Compliance What are the cloud provider’s auditing procedures? The cloud provider’s ability to help you meet your regulatory and compliance requirements? For both of these, Unisys has extensive security and auditing done frequently, and we have achieved very prestigious certifications and ratings, including ISO 27001, ISO 20000, and SAS 70 type II. Even better, we provide our customers with access to a database that helps them integrate our capabilities with their own Compliance needs. This type of information simplifies and speeds up your needs to meet compliance for your applications. The Bottom line is that only Unisys can provide a secure cloud capable of running business applications with built in security. Other Cloud providers would have to redefine their whole cloud environments in order to accommodate a shared computing environment that was also secure. Of course, there are a few applications that run on a cloud that have had some degree of security built into them that can handle multiple tenants. But, unfortunately, most business applications were not designed from the beginning to run multiple tenants, and to provide the security needed. 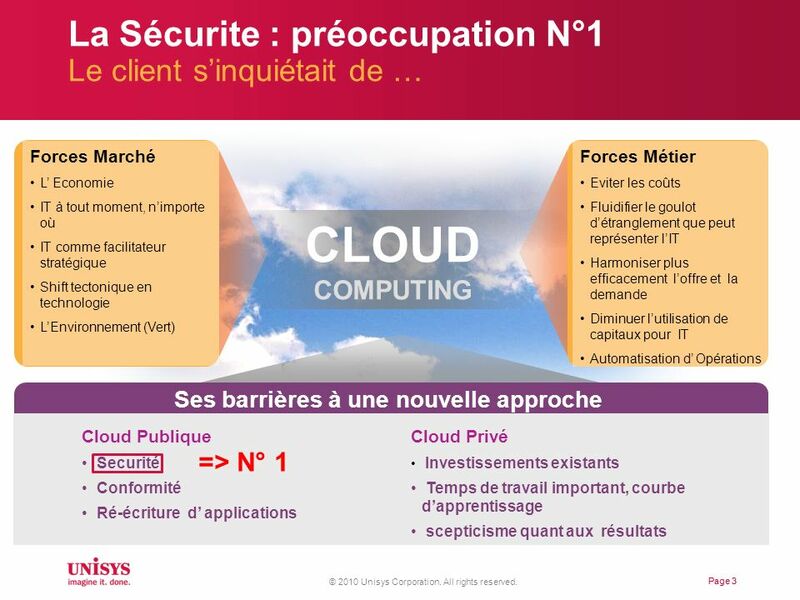 Demande à Unisys: Pouvez-vous éliminer ces préoccupations et rendre le cloud vraiment sécurisé? L’accès aux données est défini par communautés d’intérêts, sur une infrastructure commune et consolidée. 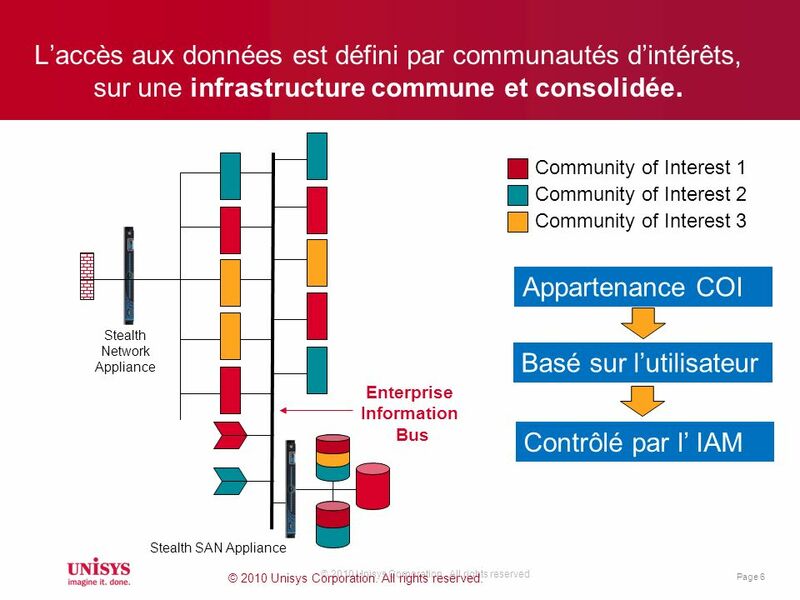 Community of Interest 1 Community of Interest 2 Community of Interest 3 Appartenance COI Stealth Network Appliance Basé sur l’utilisateur Enterprise Information Bus Contrôlé par l’ IAM Stealth SAN Appliance © 2010 Unisys Corporation. All rights reserved. 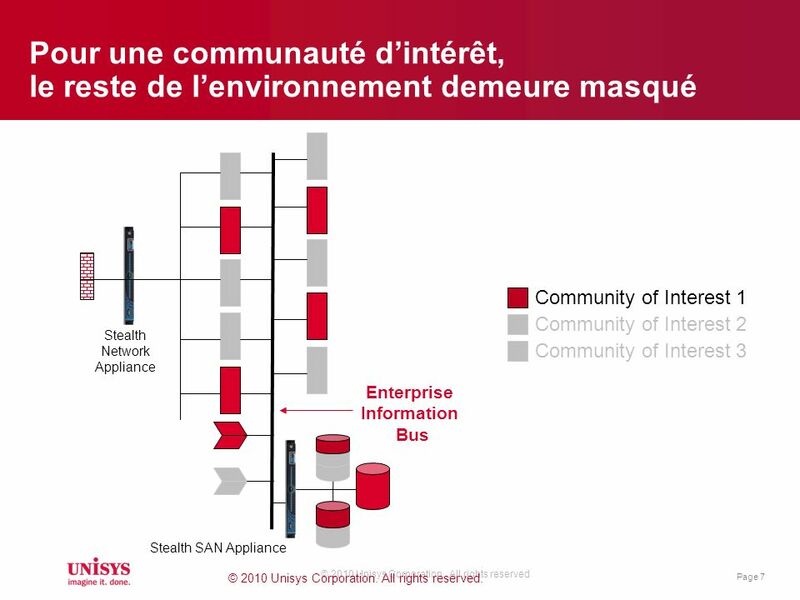 Pour une communauté d’intérêt, le reste de l’environnement demeure masqué Community of Interest 1 Community of Interest 2 Community of Interest 3 Stealth Network Appliance Enterprise Information Bus Stealth SAN Appliance © 2010 Unisys Corporation. All rights reserved. Bottom Line More expensive: for client and Cloud provider In-elastic: Unique solution for each application / client Impractical: Takes significant time and cost to set up and maintain Typical Cloud Facility Must web-enable applications Client A Virtual Web Server Client B Virtual Web Server Client A Virtual App Server Client B Virtual App Server Client A Virtual DB Server Client B Virtual DB Server VPN/SSL Network Storage encryption Client A SAN Conclusion Plus sécurisé et moins coûteux => partagé Plus simple, standardisé, et beaucoup plus flexible Pas de besoin de changement d’application Stealth Endpoint Client B Client A Stealth Network Appliance Internet Stealth Protected All data in blue is safe A Virtual Web Server B Virtual Web Server A Virtual App Server B Virtual App Server A Virtual DB Server B Virtual DB Server Stealth Storage Appliance SAN Unisys Data Center Key Message: In contrast Stealth secures the cloud simply, at less cost and creates a more flexible and usable cloud Let’s contrast the Unisys Secure Cloud which has been enabled with Stealth technology. A Unisys client will have complete end to end security, without modifying their existing applications. How do we do this? We install a Stealth Network Appliance for each client. Now data can be sent safely across any network, including the internet. Each client’s application(s) can be run on our Stealth-enabled Secure Cloud infrastructure without modifications. Stealth isolates each client’s applications, data. Stealth allows you to define specific communities of interest, and only entities within a community of interest will have access to the data and resources. 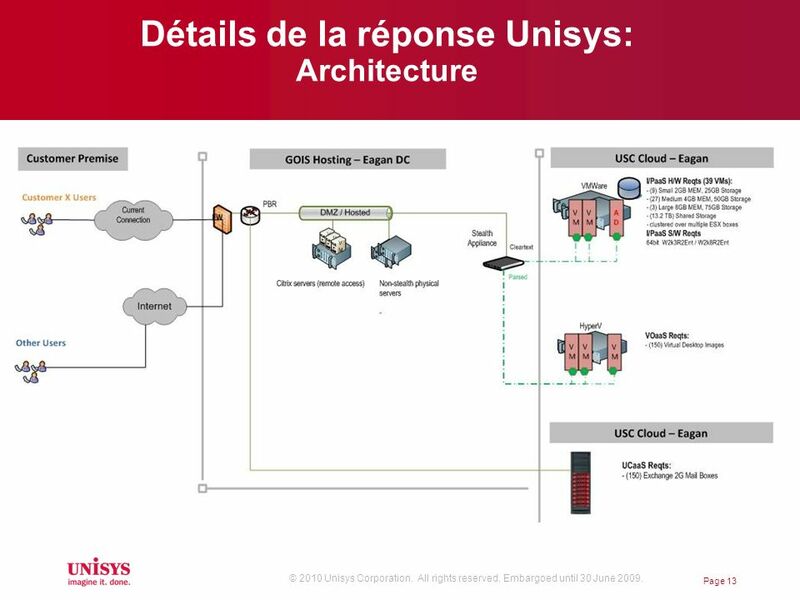 If you look in the diagram showing the Unisys outsourcing facility where we host our Secure Cloud Solution, each virtual instance includes a Stealth Endpoint which protects and isolates. This allows us to define a very simple infrastructure. You can see that we are able to host multiple applications and even customers on the same hardware systems (Gray) in their own virtual instance. Note that we only have one firewall as we do not require dozens of firewalls, and layers of security software, because Stealth already isolates each community of interest. Stealth for SAN does the same for client data, and isolates each community of interest and their data. While this slide depicts using the Internet, some clients may choose to use a private network for higher performance. Bottom line is this solution is much more secure, simpler, and less expensive plus it allows us to respond much faster to your changes. Maybe even more important is that clients can run their existing applications without investing in significant modifications. 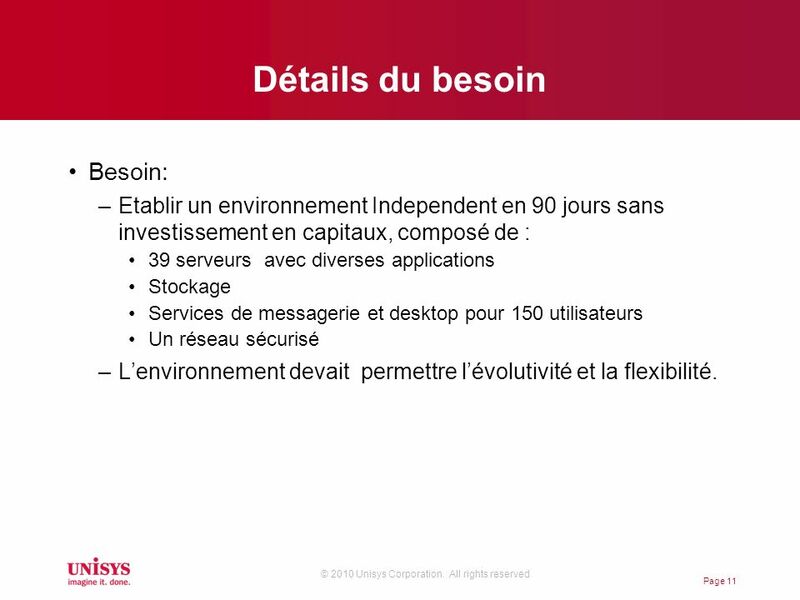 Etablir un environnement Independent en 90 jours sans investissement en capitaux, composé de : 39 serveurs avec diverses applications Stockage Services de messagerie et desktop pour 150 utilisateurs Un réseau sécurisé L’environnement devait permettre l’évolutivité et la flexibilité. Télécharger ppt "Luc Leysen, Expert en sécurité, Unisys Novembre 2010"
Administration. Administration Enjeux L’efficacité et la fiabilité de l’Infrastructure Technologique (IT) sont des facteurs critiques de réussite. 1 Séminaire TRIGONE - QUEL FUTUR POUR VOTRE PRODUCTION Z ? Licensing Serveur Azure Juillet 2012. Office 365 pour les professionnels et petites entreprises. Santé pubic Plan catastrophe Globalisation de léconomie Agenda vert Emissions Phénomène durbanisation Population viellissante Qualité de service Enjeux. Alti Copyright 2006. All rights reserved.. 2 ALTI Copyright 2006. All rights reserved. Sommaire Architecture BI 1 Entrepôt de données 2 Acquisition de.